Here’s a look at the image that’s gotten the Destiny community launching into speculation mode, originally posted on the @FWCReddit Twitter page. It’s a tricky read but, thankfully, loads of commenters have already done the leg work for us, translating that single blurry image into a list of potential DLC plans stretching into late 2015. I still have to wonder why any employee would risk being fired just to leak this image to the world, unless it’s one of those intentional “leaks” meant to build buzz and judge feedback. Since the original season pass only listed two DLCs, chances are pretty good that these new pieces of content will come at an additional price. That seems pretty fair to me, considering how much they’ll be adding to the game. 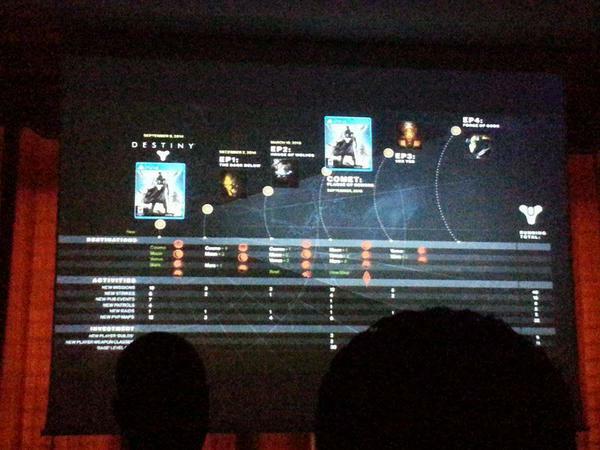 Again, this is all rumors for the time but, assuming it’s true, what are your thoughts on the 2015 calendar for Destiny?